Last September, when my Liberty and Justice exhibit was cancelled at a local venue, due to its political content, 2 arts organizations immediately came to the rescue. The New England Quilt Museum quickly rearranged their exhibition space to accommodate an expanded version of the original concept, which they showed for 3 months last fall. It was their idea to add a section of my earlier work, which my husband Rob labeled “The Innocent Years”. 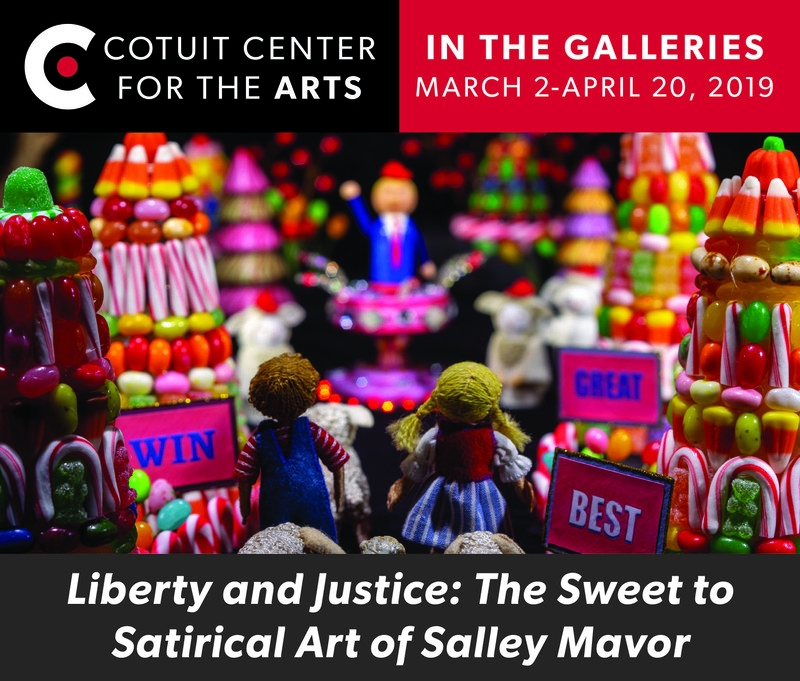 Now, the Cotuit Center for the Arts on Cape Cod is hosting Liberty and Justice: The Sweet to Satirical Art of Salley Mavor until April 20. To read a review of the show from the Falmouth Enterprise, click here. 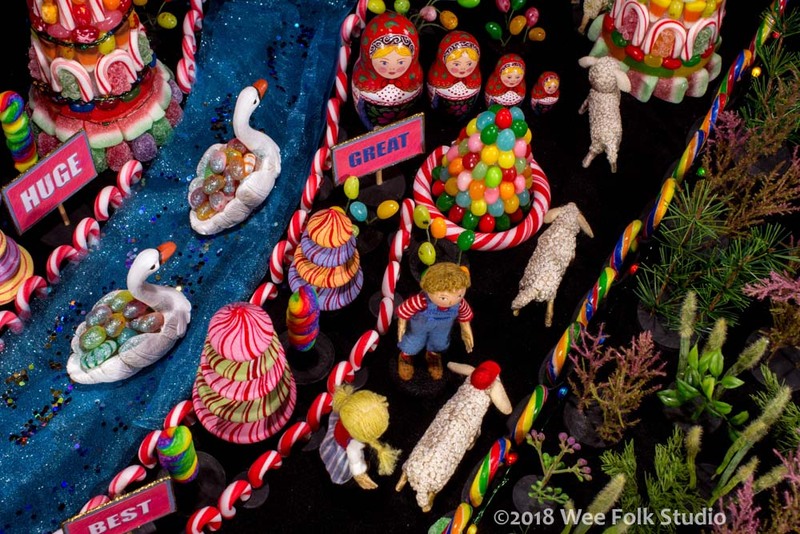 A friend passed on this comment she received from an acquaintance named Zoe, who went to see the show on her recommendation – “The Mavor exhibit was so perfect and captivating! I’m so interested in the moment where she must have realized that her medium was perfect for what she wanted to say.” She and everyone else can find out on April 13th at 11 AM, when I give my Artist Talk. For the Cotuit show, I’ve added more framed cartoons and early pieces, and I’ve set up 2 display cases with scenery and props used in the filming of the movie. 18 enlarged photographs from the Wee Folk Players series of satirical cartoons (including the doll house set), 13 minute stop-motion animated film – Liberty and Justice: A Cautionary Tale in the Land of the Free, Displays of 3-dimensional characters, props and scenery from the animated film, A collection of earlier work from “the innocent years” – embroidered bas-relief pieces, children’s book illustrations, Self Portrait: A Personal History of Fashion , Rabbitat and Birds of Beebe Woods. 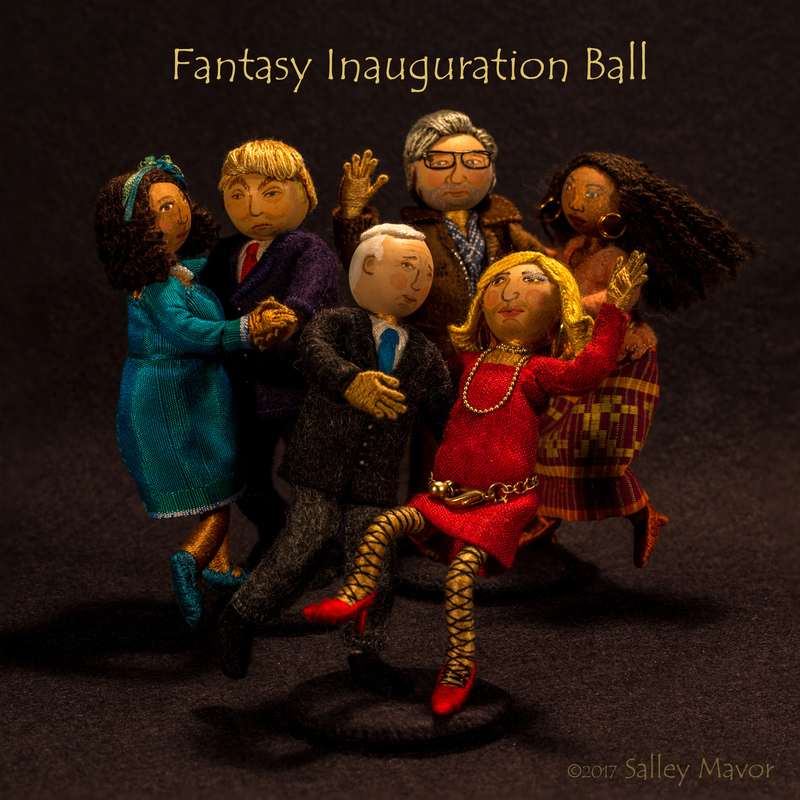 The exhibit is an opportunity to see a wide array of works by fiber artist and illustrator, Salley Mavor, who has recently added political satire to her repertoire. 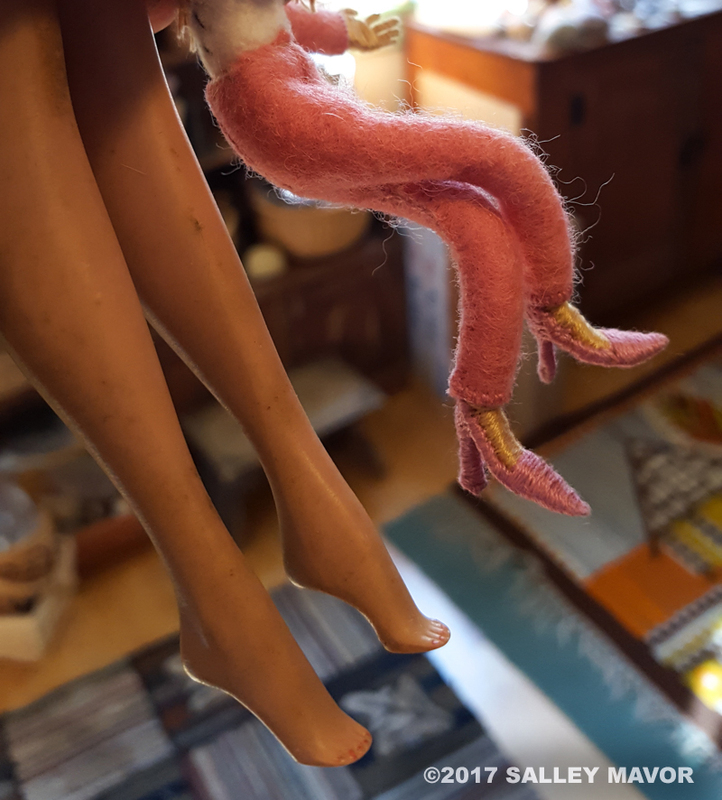 She uses small dolls as a metaphor for living in a safe controlled environment that has been taken over by outside political forces. 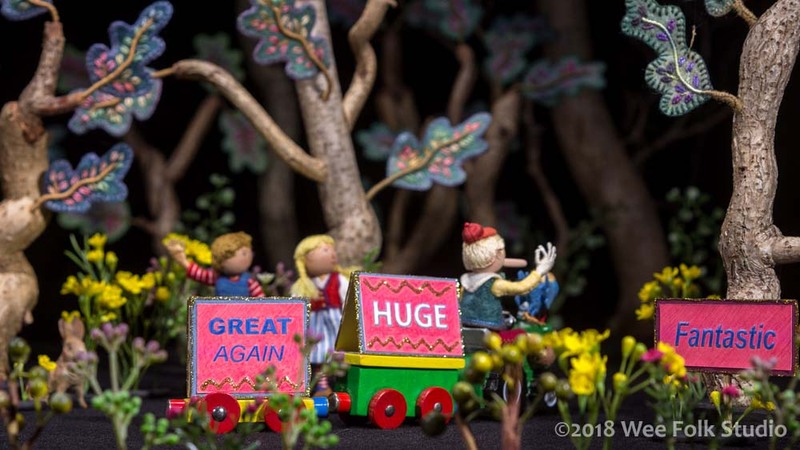 The exhibit features a collection of photographs of scenes she created in a doll house and a stop-motion animated film, which satirize the Trump administration. The original dolls and props used in the film will also be on display. Although Ms. Mavor’s foray into political art is the centerpiece of the show, the exhibition also includes original embroidered children’s book illustrations and other artwork from earlier in her 40-year career. The inclusion of these pieces tracks the evolution of her artistic journey from “innocence” to tackling real world issues. The exhibit is located upstairs, with the wall facing the balcony dedicated to the sweet section of the show. By far, the favorite in this group is Self Portrait: A Personal History of Fashion , which a lot of people can relate to. The politically satirical portion is shown in 2 side spaces. One has the Liberty and Justice film and display cases full of the real dolls, props and scenery used in the film-making process. The other side has the photographic “cartoons” and the doll-house stage set. For the show, I matted and framed 18 enlarged photographs of the Wee Folk Players cartoons, which were produced in the first 6 months after the election. Michelle Law, the center’s gallery manager, was incredibly helpful and a delight to work with during the installation. The doll house, which I made in art school over 40 years ago is also on display. 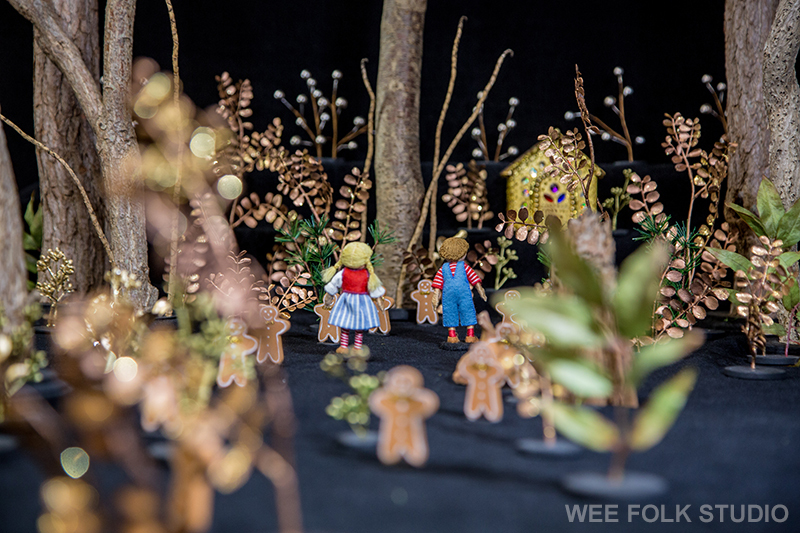 It served as a stage for the Wee Folk Players in many of the scenarios we photographed. I hope that those of you who live within a manageable distance of Cape Cod can make a trip to see the show, which runs until April 20 at the Cotuit Center for the Arts, Cotuit, Massachusetts. I will give a talk about the evolution of my art from “Sweet to Satirical” on Sat., April 13th at 11 AM. Next, a portion of this exhibit will be included in The Art of Cute, which takes a serious look at a powerful aesthetic that is often not taken seriously. Some of my topical and political work will be displayed in the Meta Cute or “beyond” cute category. 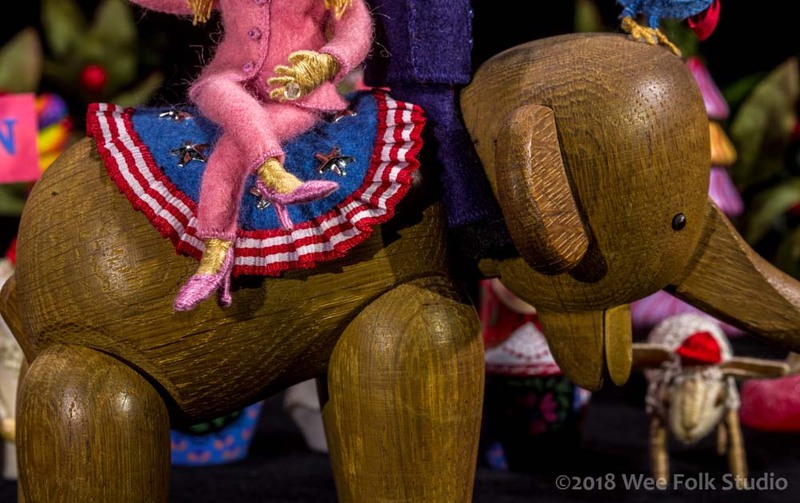 This part of the exhibit explores how cute, combined with other aesthetics, can create meaningful art that is ironic, disturbing, political, joyous humorous and provocative. I want to express my gratitude for the outpouring of support since my exhibit was cancelled due to its political content a few weeks ago. Since then, the film and the Wee Folk Players are taking on a life of their own, thanks to your willingness to share them. The work is growing in strength on the internet and is making its way across the country and around the world. I feel like my relationship with the art has evolved – there’s no need to prop it up anymore and I’m scrambling to keep up with its momentum. I am happy to report that the New England Quilt Museum in Lowell, MA has generously stepped in to host the show. 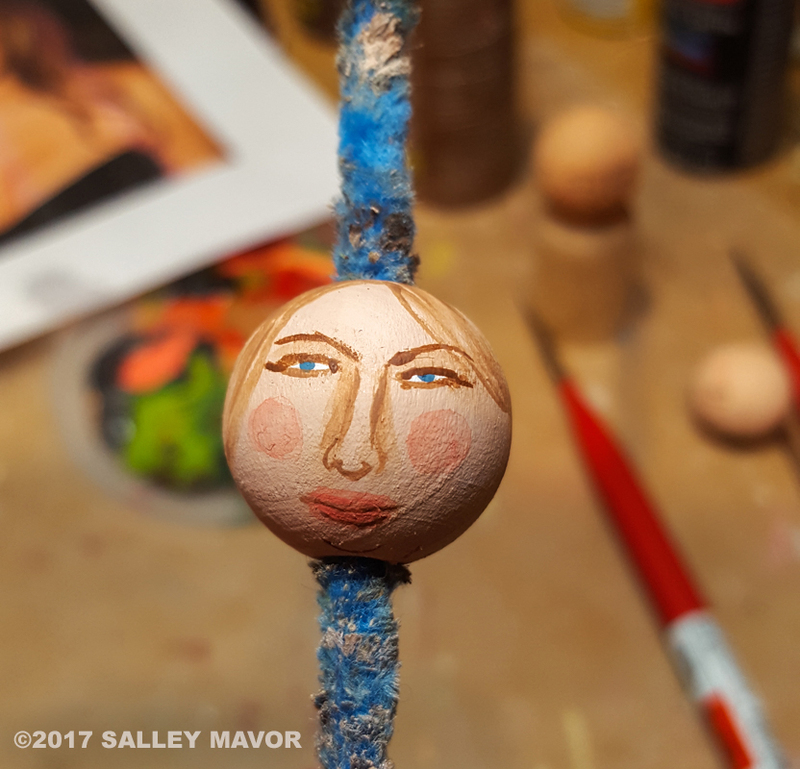 The exhibit, titled Liberty and Justice: The Satirical Art of Salley Mavor will be on display at the museum Sept. 26 – Dec. 30, 2018. The show will then be at the Cotuit Center for the Arts on Cape Cod, March 2 – April 20, 2019. Exhibits featuring my work are listed here. This is just a quick note to let you know what’s happening. After the artwork is delivered and installed, I will write another post about the show. UPDATE: The exhibit in question has been picked up by 2 venues. 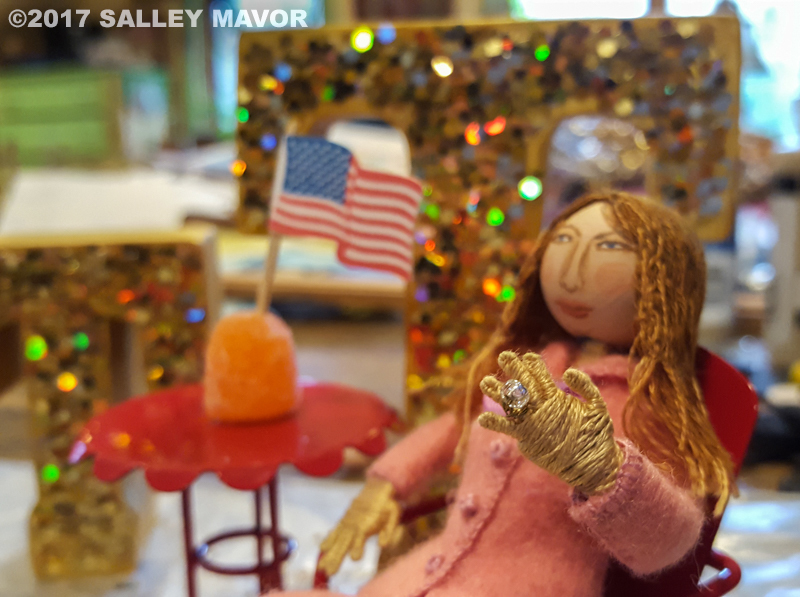 Liberty and Justice: The Satirical Art of Salley Mavor is at the New England Quilt Museum until Dec. 30, 2018 and will then be at the Cotuit Center for the Arts, March 2 – April 20, 2019. What do you do when your art is censored? Do you jump up and down and make a stink or do you take a deep breath and think about what it means? I’ve been doing mostly the latter for the past week, but I’m ready for reasoned action now. My solo exhibit, Liberty and Justice: New Artwork by Salley Mavor, which was to open this weekend at a nonprofit cultural center was cut to the point where there weren’t enough pieces left to warrant a display. So, I was forced to withdraw the remaining pieces from the whole exhibit, 10 days before the opening, after a year of coordinated planning. The organization is not named here because I do not want to discourage people from seeing the other engaging exhibits they will present. And I do not want to cast the staff and volunteers in any sort of a negative light. They are wonderful to work with and were not involved in the discussions about my show. Also, the issue isn’t just about this one venue. It’s about the culture of fear that is growing, creating an atmosphere where questioning and dissent are silenced. You may ask, how did this happen? Economic concerns, basically. The members of the venue’s board of trustees were afraid that because this show is controversial and asks the viewer to ponder our current political climate, some donors might be offended and donations could fall off. The overall opinion was that my show should be emptied of political content, with no dolls who are recognizable as Trump or Pence, etc. The idea was to remove the polarizing figures so that everything will be fine and no one will be upset. They didn’t want anything political, so it meant no film and satirical cartoons from the Wee Folk Players. 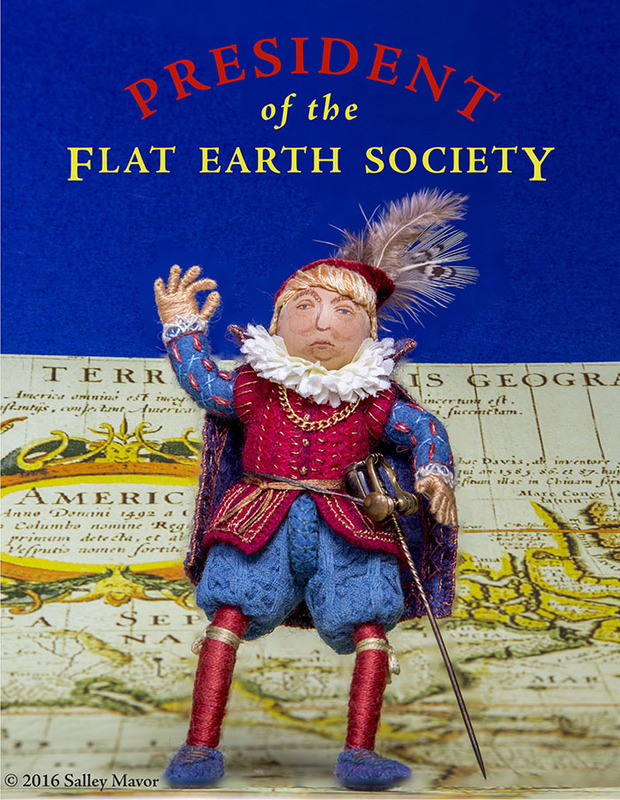 No Trump in a Tudor style outfit as President of the Flat Earth Society and no Pence dancing with a trans person dressed in fishnets and high heels. I think that most board members were unaware that their no tolerance position on any political content would result in the show’s cancellation and create an absence that would have to be explained to the visitors who show up to see my work. My exhibit was to demonstrate how a contemporary artist uses fiber art techniques to make a statement about today’s world. The new direction of my work leaves behind the cute idyllic and safe fairy world and jumps head on into political territory. 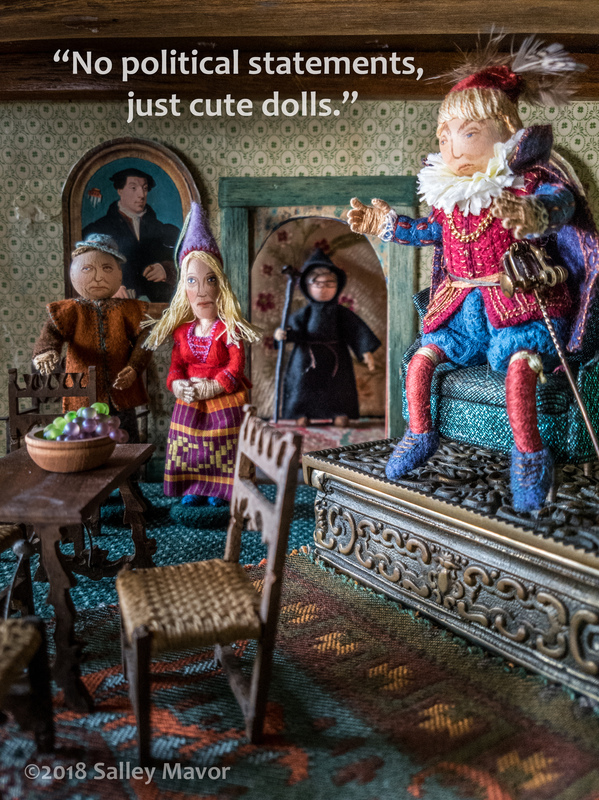 The dolls are a metaphor for playing house in a controlled environment, one that has been taken over by outside political forces. For me, the work is about stepping away from a safe, sheltered existence and into a very real reality, one where there is possibility for action toward making a difference in the world. You could call this new direction “sweet resistance art”, since it delivers a strong message in a pretty package, one that is not in your face, even though it does have a tough meaning. My new work has been described as witty, ironic, sophisticated and adorable but chilling. It is a thoughtful critique of the current administration in Washington, with every detail chosen for a reason, and all based on actual things said or done. I don’t expect everyone to agree with my point of view, although many find my artwork refreshing and full of comic relief. 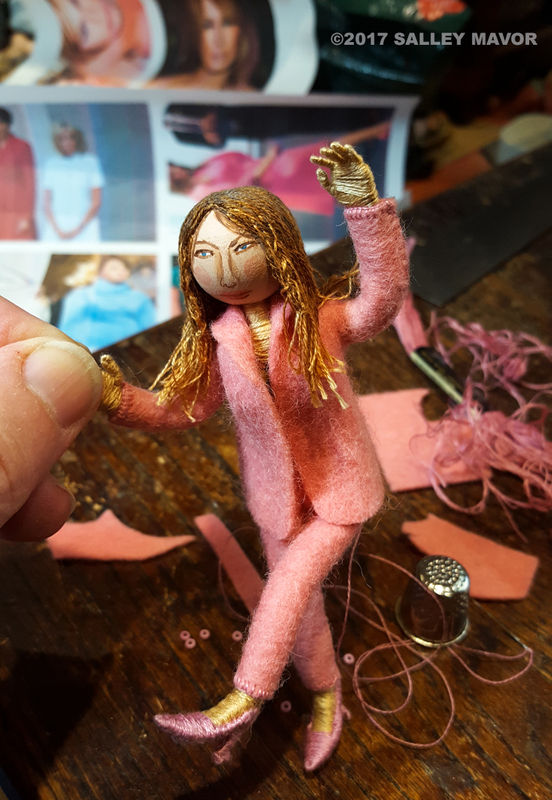 To remove the political part would be like taking the stuffing out of the dolls, leaving limp characters of very little consequence and nothing important to say. My husband Rob and I have talked about this a lot and have declared this show a success! These little dolls are powerful – they’ve conjured feelings and sparked discussion about art’s place in the world. Unfortunately, they are being silenced, but that is also part of the reaction and the reality of our society today. People are fearful and I understand that, but somehow I am not afraid. Sure, I get nervous every time I put out something political, but I feel like I’m learning about what it means to be an artist through and through. Not for a moment do I think that what I’ve created is not valid or meaningful. People have come to expect a certain kind of expression from me, of sweetness and childhood wonder. They’re surprised to find that I can also make art that is strong, funny and dark. It’s so odd to think that I make cute dolls that instill enough fear in people to get them seriously worried. What a crazy time, in a beautiful world! 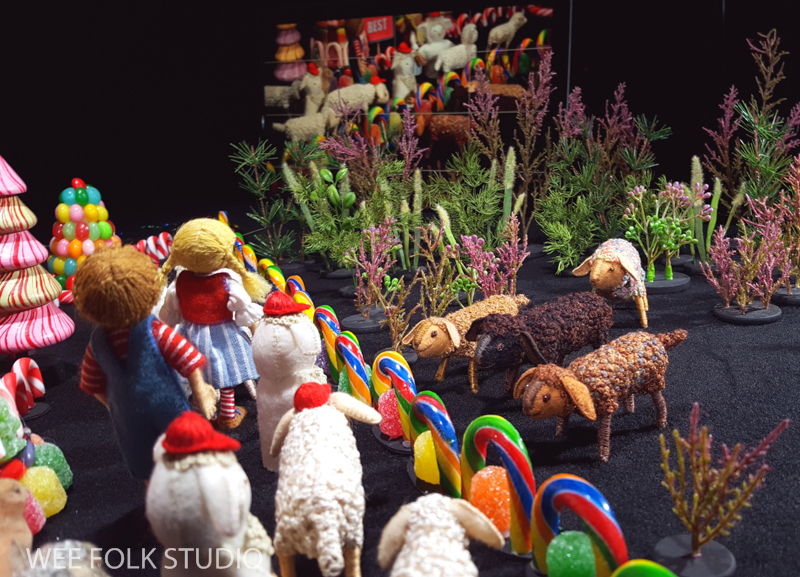 Share this Facebook photo album or this blog page with scenes from the Wee Folk Players (They’re a Stitch). Share our animated short film Liberty and Justice: A Cautionary Tale in the Land of the Free, which is now on YouTube here. Please let people know that this work was pulled due to its content, and comment on your beliefs about censorship in the arts. Let your voice be heard, too! This is but the latest chapter in the ongoing saga of my artistic journey. As always, thank you for following along. 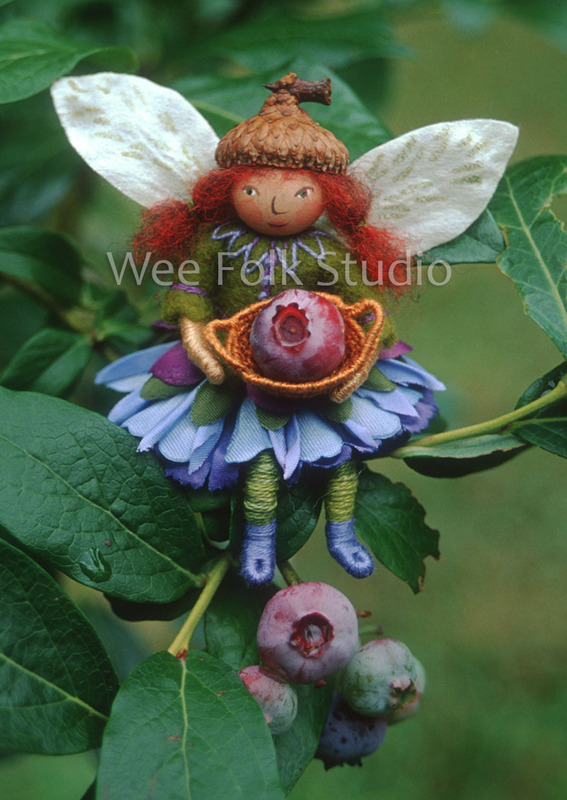 To see posts with individual Wee Folk Players cartoons, plus commentary please visit this page. Liberty and Justice – the movie! What happens when a pair of lost citizens wander in the deep dark woods in search of a new leader? 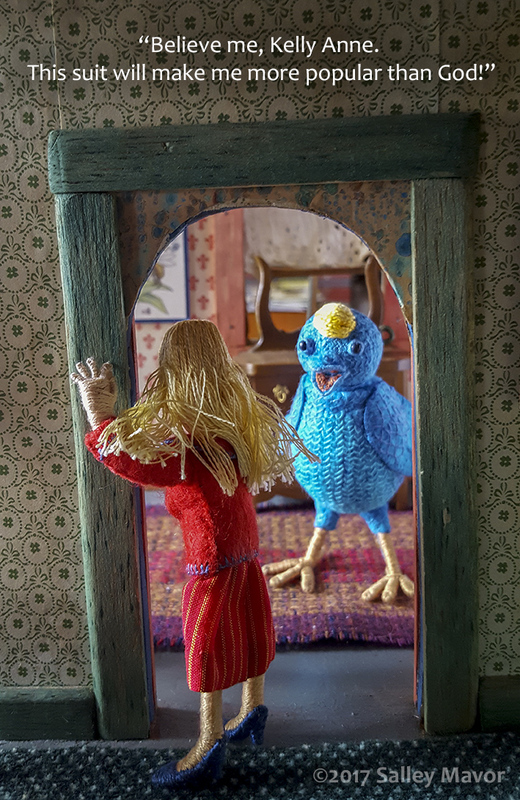 In this satirical take-off of the traditional folk tale, “Hansel and Gretel”, the wordless story follows protagonists Liberty and Justice as they negotiate the challenges of today’s unique political landscape, while being shadowed by a persistent Twitter bird. The film is a dark satire, made in the exaggerated style of caricature. It includes a dramatic scene with President Trump dressed in the uniforms of some of history’s most iconic dictatorial rulers. The comparisons are symbolic and are not to be taken literally. They serve as a warning, to look at history for guidance when confronted with a president who exhibits authoritarian behavior. The 13 min. movie is at the end of this post. The film features an ensemble of old and new cast members from the Wee Folk Players theater troupe, who formed soon after the 2016 election. 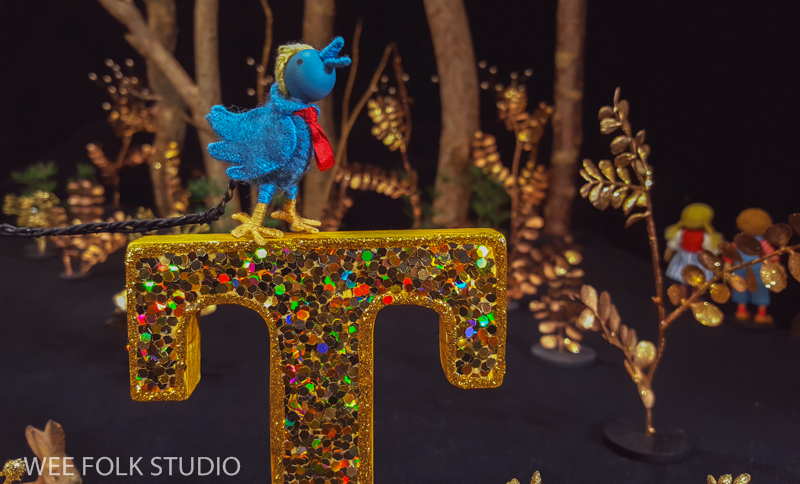 Other posts about the Liberty and Justice animation project include “Liberty and Justice” in process, All that Glitters, America First Lady, stop-motion in action, costuming despots and innocents and Animated Film Logo. In this Interview on WGBH TV, I reflect on my foray into political satire and describe how speaking out through art has affected my work and life. After about a year filming in the basement, where our animation stage is set up, my husband Rob Goldsborough and I are thrilled to share the fruits of our labor! It’s the first large joint artistic/technical venture we’ve undertaken in almost 40 years together. 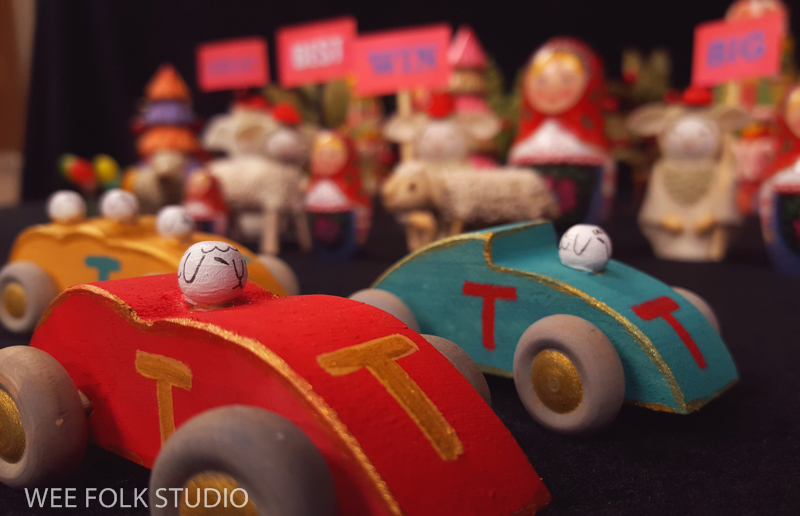 We used stop-motion animation to create the narrative, spending countless hours manipulating and photographing the characters and props so that they appear to move on their own when the series of frames is played in fast sequence. 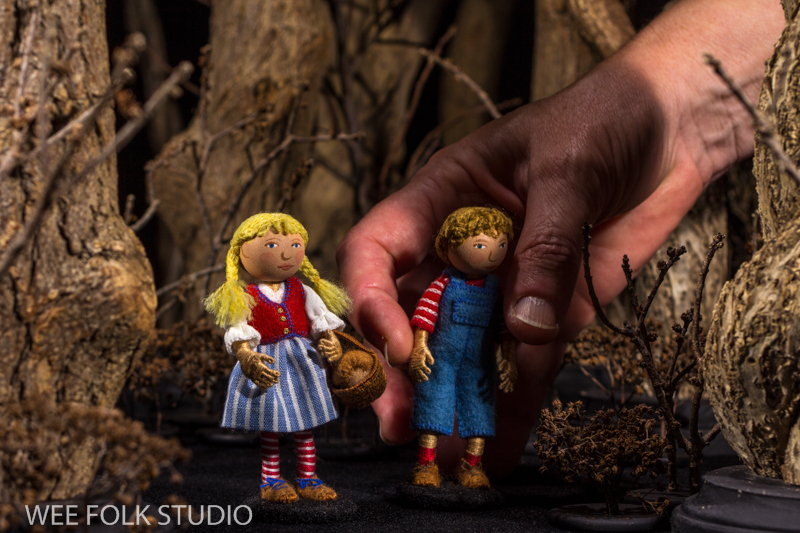 We each had our field of expertise – I made all of the dolls and scenery and did the animating, while Rob contributed his talents in photography, lighting, computers and editing. Rob, a retired engineer from the Woods Hole Oceanographic Institution has had a life-long interest in photography and film-making. He and I have wanted to bring my wee folk characters to life through animation for many years – we just needed a compelling reason to jump in. For a framework, I drew a basic story board that grew and developed over time. Every night at dinner, we discussed ideas for different camera angles and how we were going to film the next shot. What was supposed to be a fun summer adventure, ended up becoming a big part of our lives for a whole year! The more we learned, the more invested we became in the project. Luckily, we are both detail oriented and not very chatty, so spending hours on end in silent concentration, filming what would become 5 to 20 sec. scenes was not a problem. I calculated that at 24 frames per second, our 13 min. 32 sec. animation is made up of almost 20,000 individual photographs. Even though the project was incredibly time consuming, we loved working this way and would like to make more animated films in the future. But right now, I have to get back to working on a new children’s book, which you can see progressing here. A highlight of the project has been finding and working with the musicians who produced the original score for the movie. Rob and I filmed about 100 silent scenes, knowing all along that music and sound effects would be an integral part of the finished film. Through friends, we were lucky to connect with Matthias and Carla, a local Woods Hole couple who specialize in this kind of work. I mean, what are the chances of us living just a few miles from each other in a small town on Cape Cod? We are thrilled with what they’ve created for the soundtrack! They took our movie and ran with it, blending together many layers and styles into a carpet of sound that propels the story along, creating the right mood for each scene. Their sound production company, Stellwagen Symphonette, creates evocative instrumental music for radio, film and computer games. 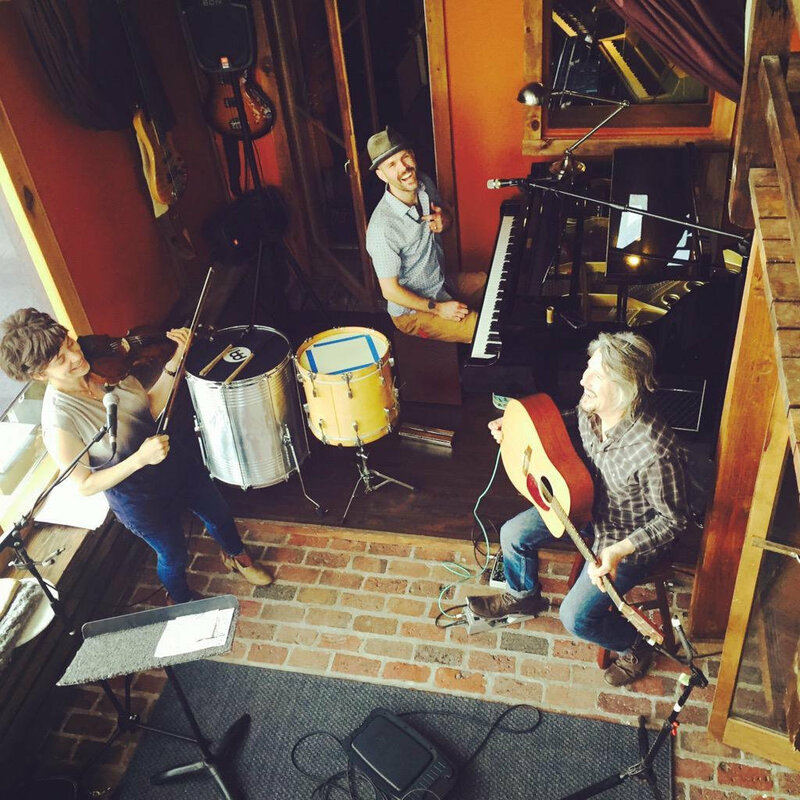 Drummer and pianist Matthias Bossi, violinist Carla Kihlsted and guitarist and engineer Jon Evans bring together many years of experience writing, performing and recording music. If you listen to NPR, you’ve heard their music embedded in stories from time to time. Their clients include This American Life, The Moth Radio Hour, Atlantic Public Media, Transom.org and Frontline Dispatch. 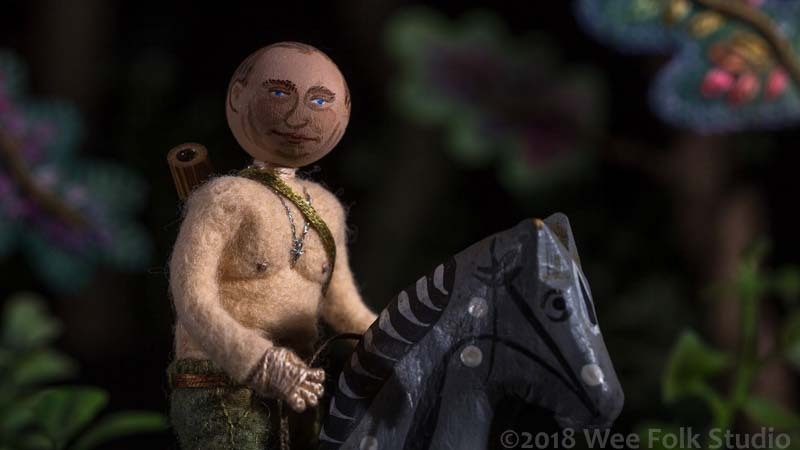 Liberty and Justice was shown in the Woods Hole Film Festival in July 2018 and won the Audience Award for short animation. I hope that you enjoy the movie! It can also be viewed and readily shared on YouTube here. To keep up with new posts, subscribe to this blog (top right column on the home page). 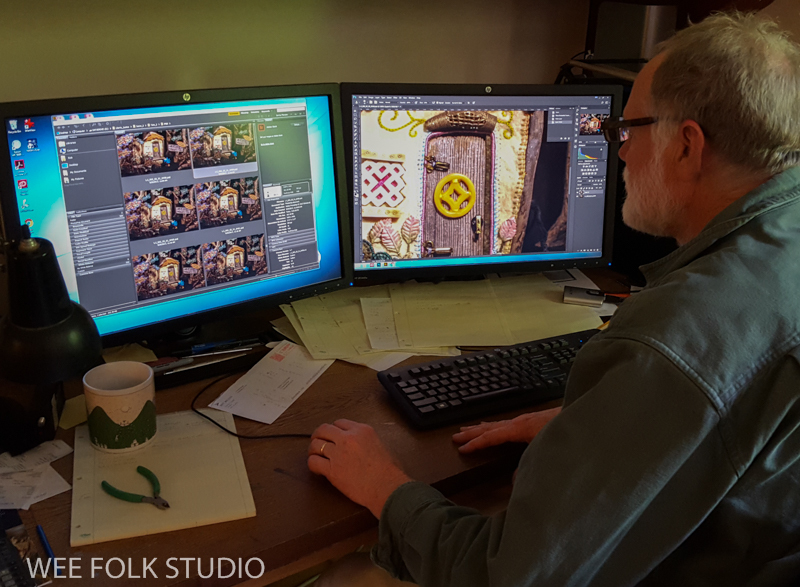 If you’d like to see more frequent photos tracking the projects in my studio, please follow me on Facebook and/or Instagram. 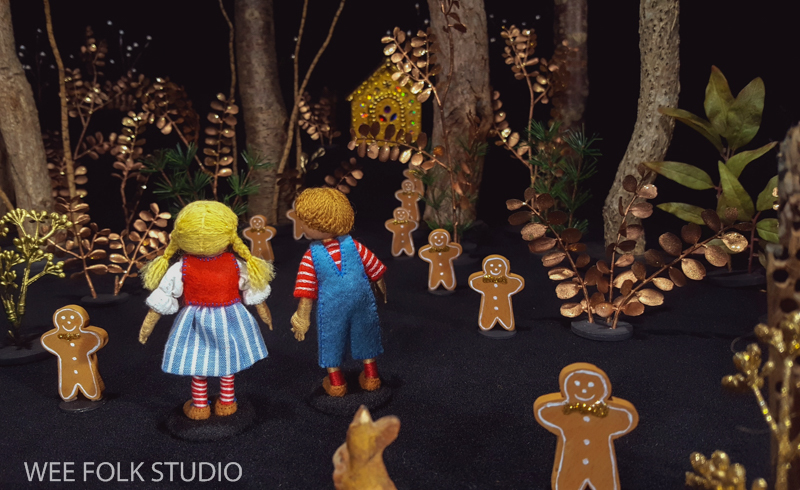 We’re forging ahead with our stop-motion animation project and can see the end in sight! 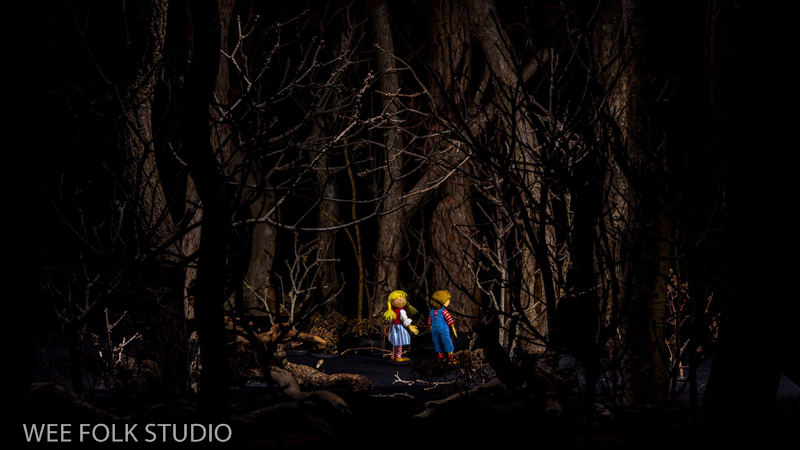 In our movie, Liberty and Justice, the protagonists (aka Hansel and Gretel) have many encounters as they wander through today’s political landscape in search of a leader. The arch of the story is loosely structured around the fairy tale, with references to the 2016 presidential election. 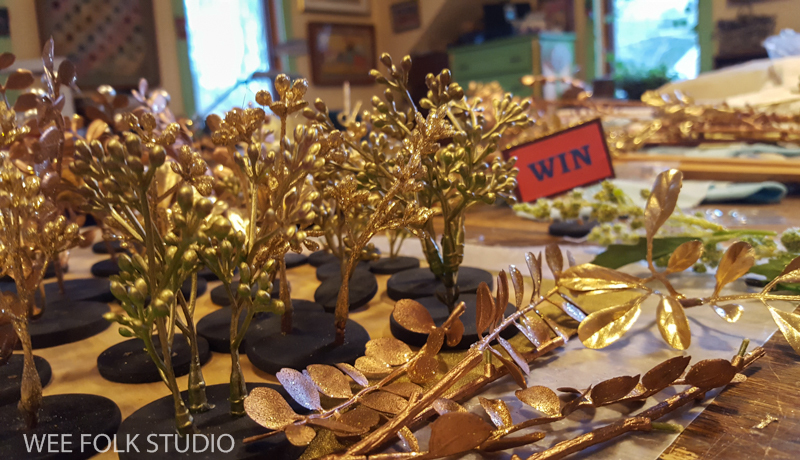 Previous posts about the project include America First Lady, Liberty and Justice in Progress and Stop-motion in action. 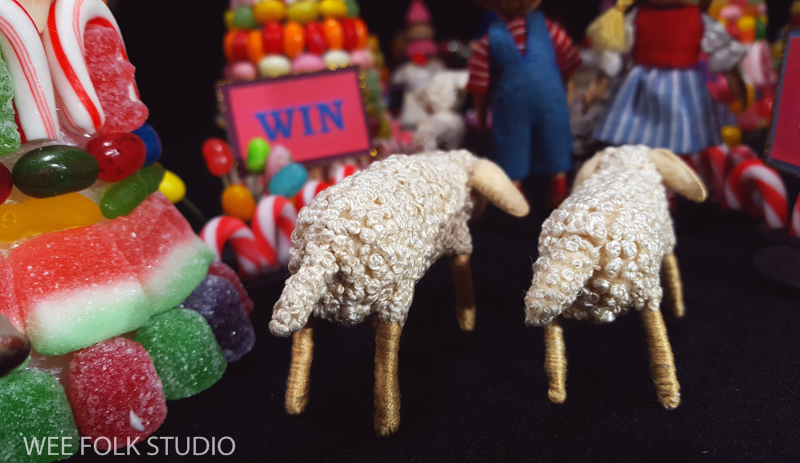 This post focuses on glittery stage sets and props that we used in a variety of scenes. There’s nothing like a shiny object to get one’s attention. That and sugary sweet stuff, which I recently showed in this post. 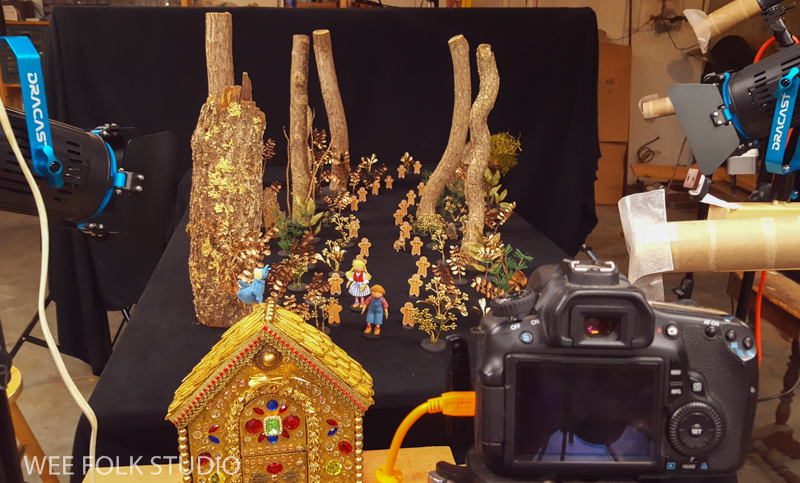 My husband Rob and I have spent the past 10 months working on the movie in our basement studio, where the stage, lighting and photo equipment are set up. Yes, it’s taken us that long to make a short (under 15 minutes) animated film. 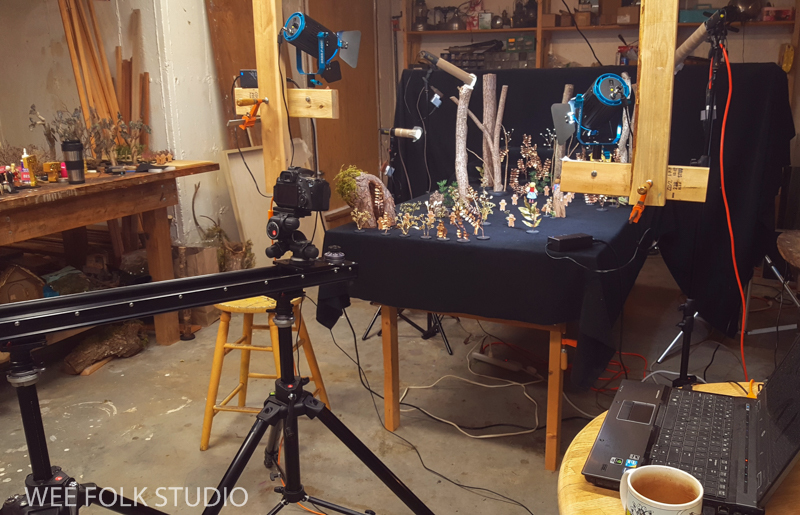 Stop-motion animation requires a lot of time and patience, but it is worth it in the end, when you see the characters and scenes come to life. We hope to have our part finished soon, so that it can be passed on to the musicians, who will compose and record the sound track. So, you may ask, when and where can I see the completed film? Honestly, we’ve been so busy filming scenes that we haven’t had time to plan its launch into the world. I’ll be sure to announce the release — maybe in the spring or early summer. 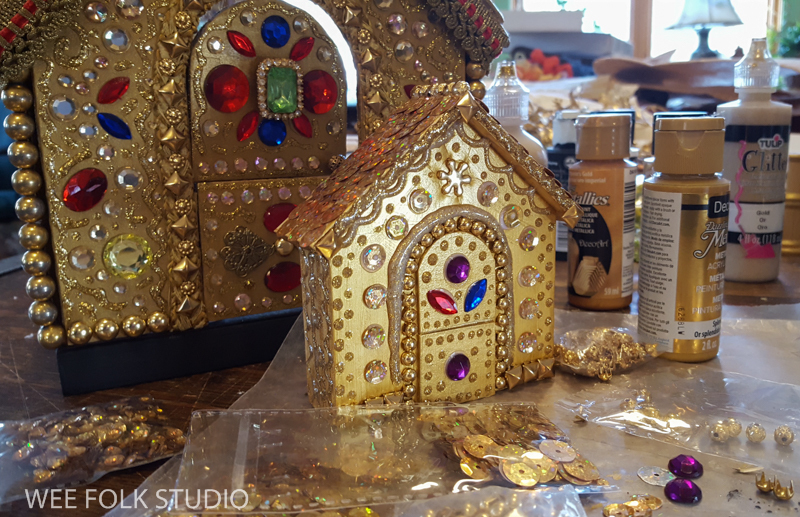 Building the house was especially fun because I could break into my supply of shiny, glitzy bits and pieces that have been standing by, waiting for a project like this. 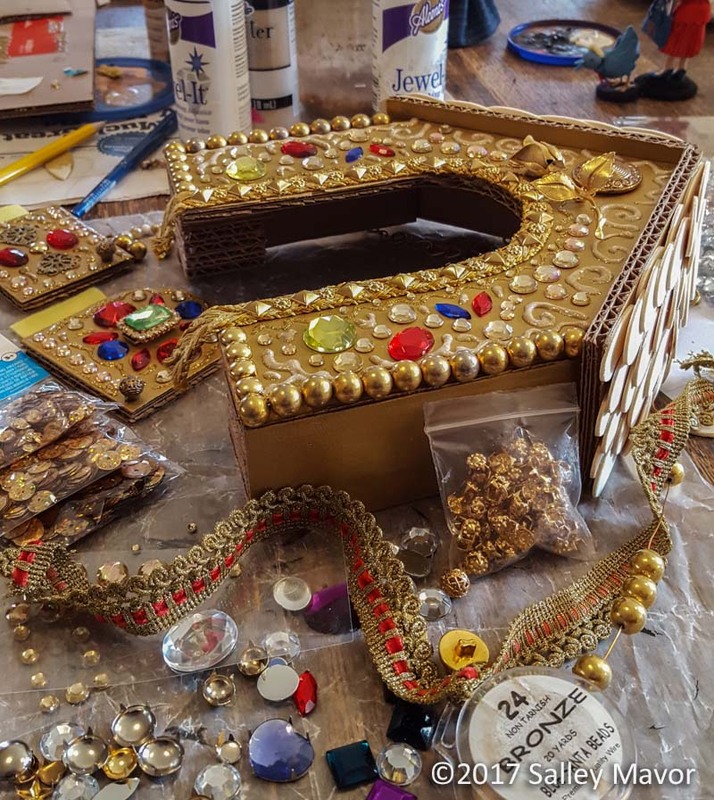 And I also discovered the joys and challenges of glitter glue. 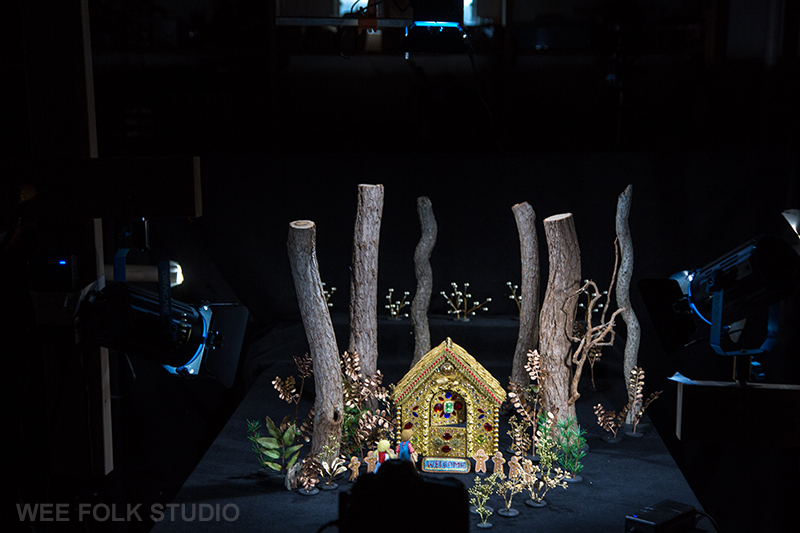 In order to create the illusion of distance in some setups, we needed a smaller scale house. So, I made a replica out of a block of plywood and foam core. 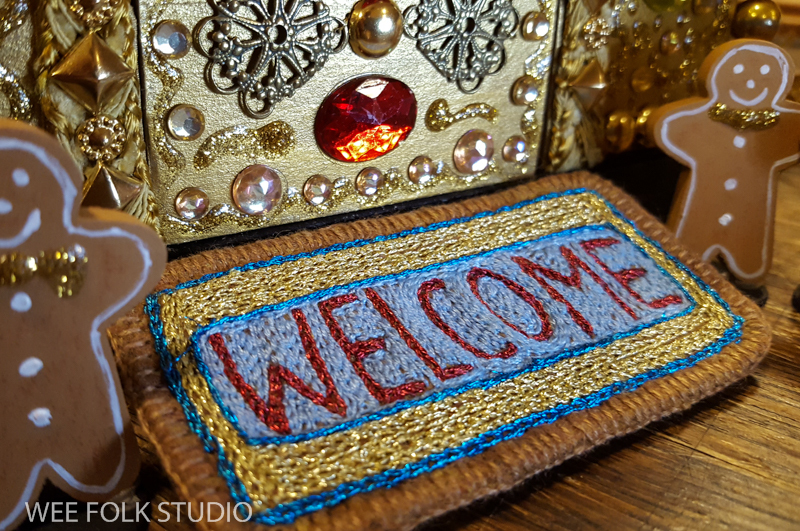 And what would a cozy cottage be without a gold encrusted door mat? 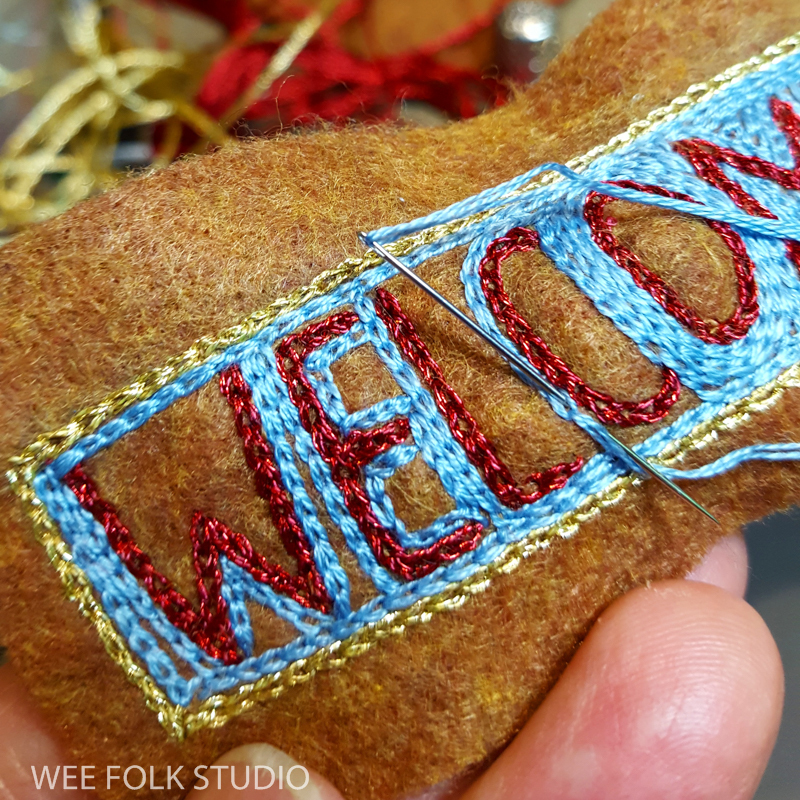 I picked some felt that looked like jute and wrote out the welcome message in chain stitched metallic thread. This photo is taken from the animator’s view of the set and off to the side is a monitor that shows what the camera sees. It’s helpful to look at the screen while I’m animating and play back the character’s movements. This part of the story required gold foliage. I almost went blind combing the isles of Michael’s, looking through all the gilded Christmas decorations! 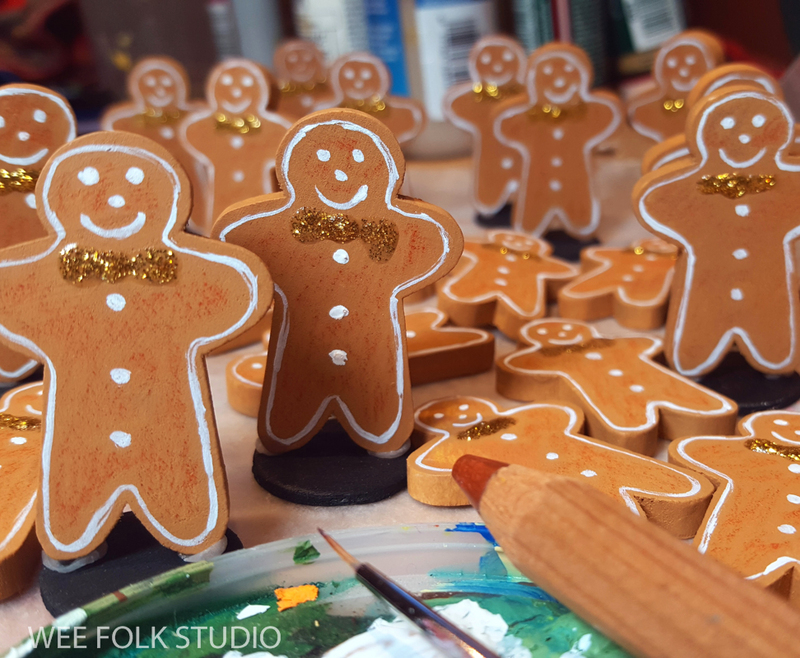 I could have made real gingerbread men, but decided to paint pre-cut wooden ones instead. 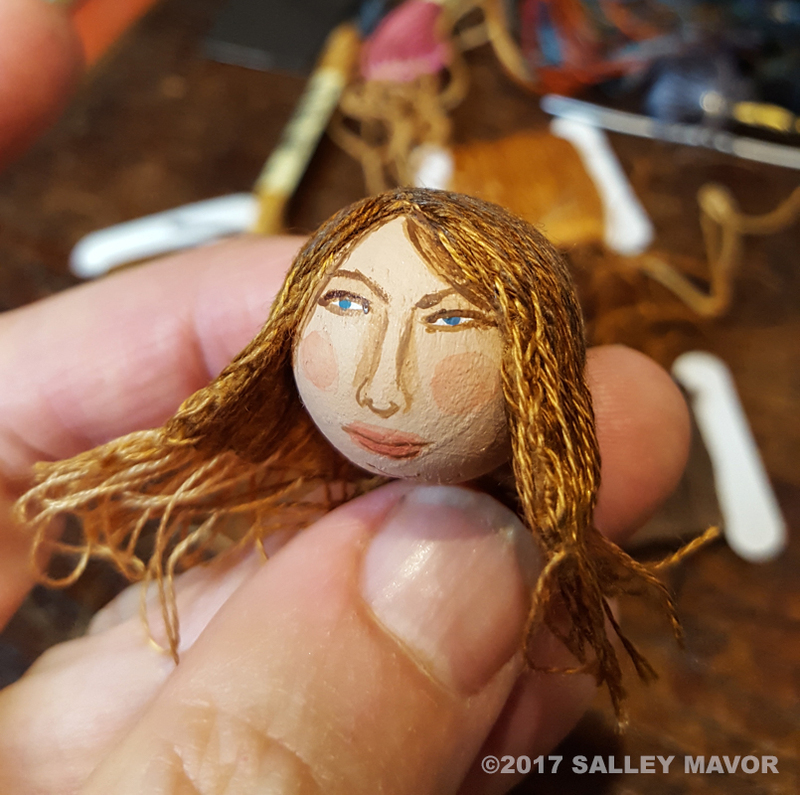 Since I normally sew everything, it’s a refreshing to work with paper, wood and paint for a change. But, in the end, I always come back to my soul mates, needle and thread. To keep up with new posts, please subscribe to this blog (top right column on the home page). 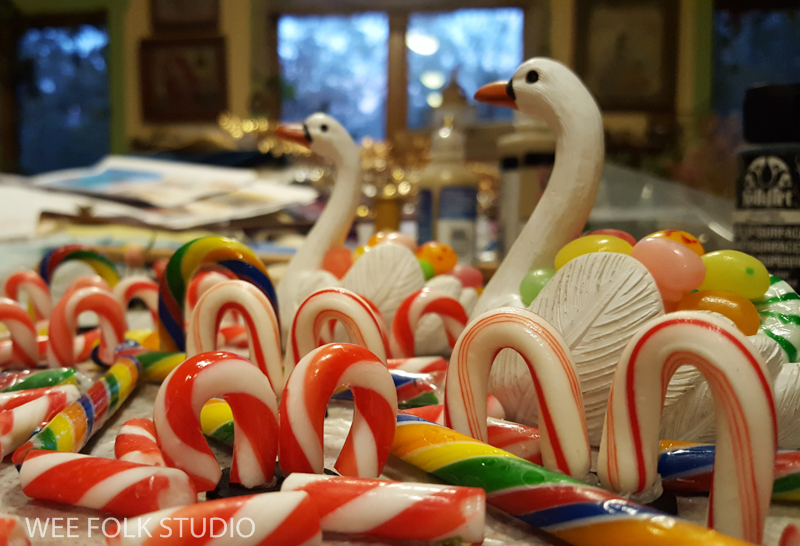 If you’d like to see more frequent photos tracking the projects in my studio, please follow me on Facebook and/or Instagram. 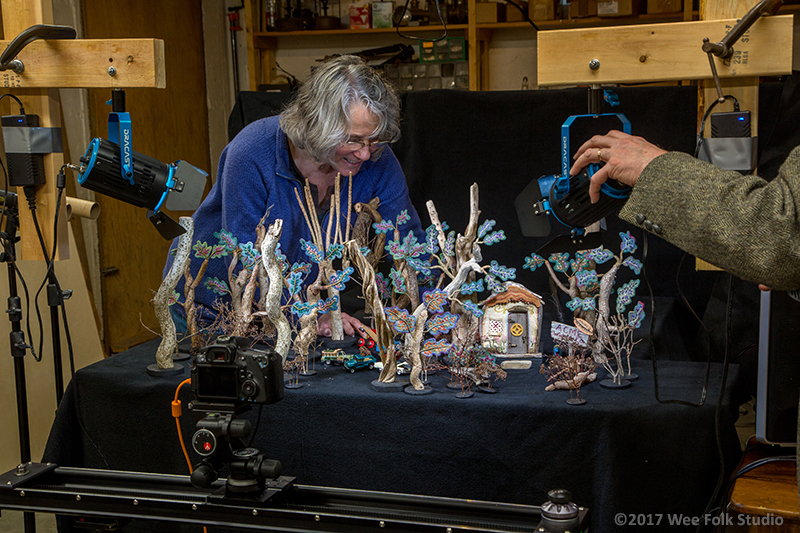 In this new year, I thought it would be a good time to bring you up to date on the stop-motion animation my husband Rob and I have been working on for most of 2017. I introduced the project a while back in this blog post. Yes, we’re still inching ahead, spending every spare hour filming in the basement. We’ve recorded 8 minutes of a 10 to 12 minute video and hope to have the filming part finished later this winter. Then, there’s the soundtrack, which is especially important for a wordless story like ours. For that, we’re commissioning an original score and sound effects from musicians and sound artists. 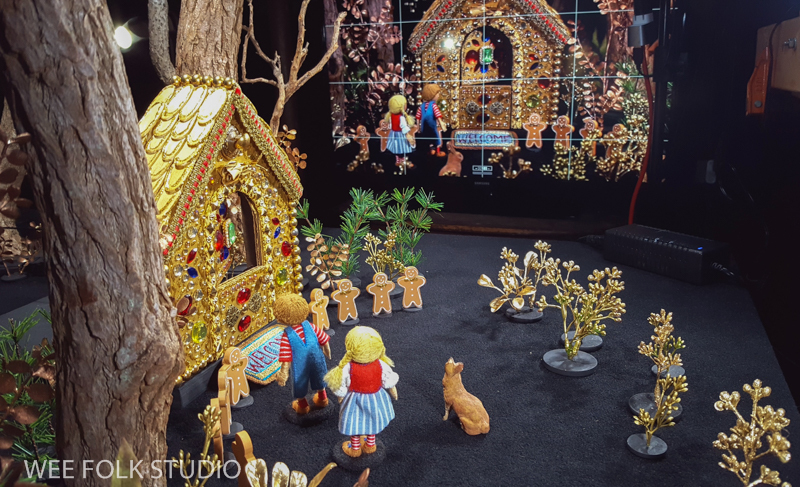 The movie, Liberty and Justice, a political take-off of Hansel and Gretel, is a cautionary tale about what happens when a pair of lost citizens wander in search of a leader. So, when will it be finished? Honestly, we don’t know, but we’re estimating that it’ll be ready to show sometime in the summer of 2018. Don’t worry, I will announce any particulars about where it can be seen, once it’s completed. To give an idea of our process, here’s a video made up of several filming sessions from last summer. Rob set up a separate camera to take time-lapse photos while we worked in the basement. It looks funny to see our actions sped up into hyper mode, when in reality our movements are painstakingly slow and deliberate. I’m animating figures, using wire rigs anchored to black blocks, which are visible to you behind the set. The monitor near where I’m sitting shows the camera view, so I can check how the scene looks on screen. You can barely see Rob with his magnifying headset behind the camera slider, as he turns on a flash light to see the measurement for each photo. Keeping in mind that this post could be a spoiler, I’ve selected a group of still photos that don’t give away too much of the good parts. You will surely pick up on some of the themes, though. 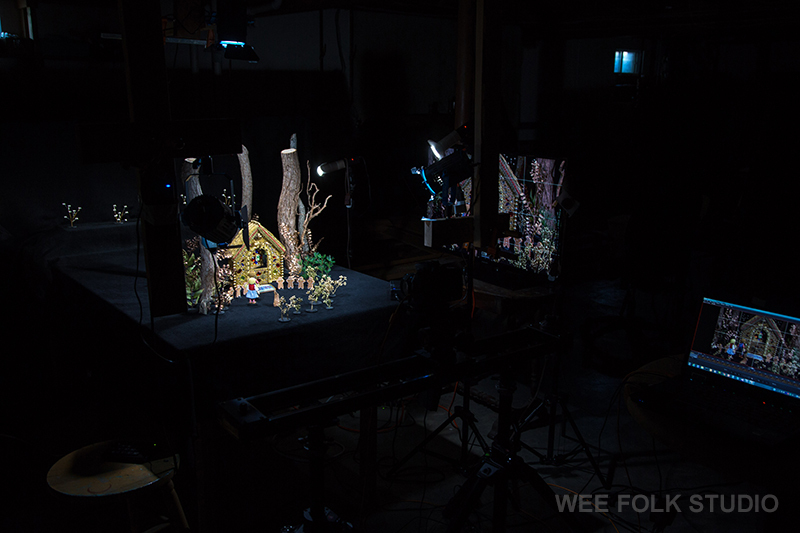 Most images show our animation stage during the last month or so. 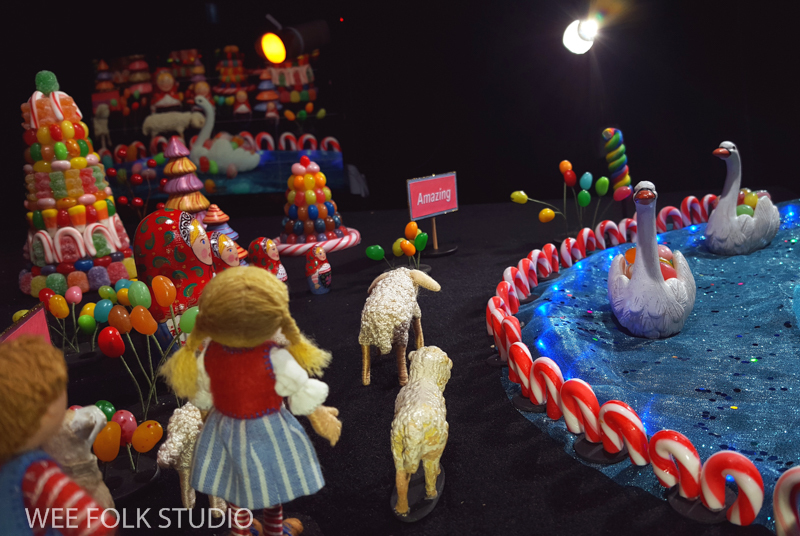 At this point in their journey, the characters (who’ve just been through a lot of challenges) enter a kind of candy land. It was so much fun setting up the scenes, which had to be adjusted according to the camera angle and movements of each shot. How do you make water for animation stage? Shiny blue fabric, jumbo glitter and mini LED lights, of course. It looks so cool when the swans move along! 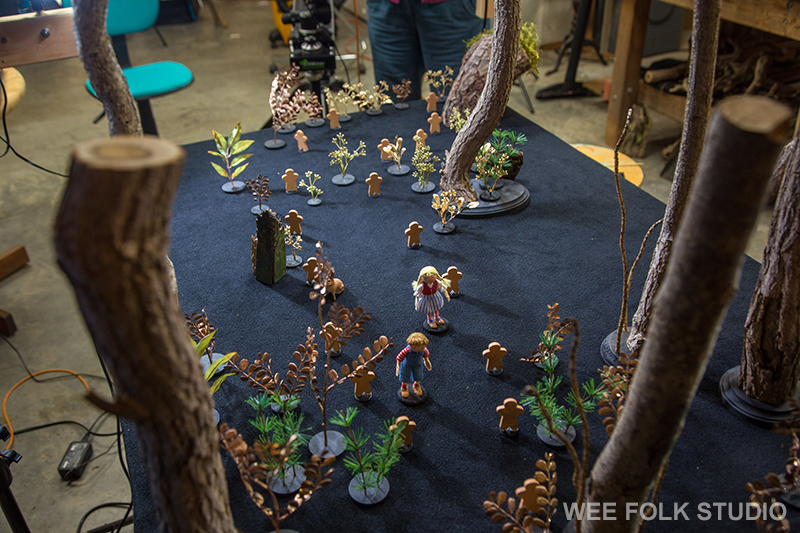 When starting the filming process all those months ago, we knew that stop-motion animation takes a long time. And we’ve since learned that it requires many forms of patience. Not only do we need the capacity to deal with all the fussy parts pertaining to animation, we have to be patient with each other. This is the first large joint artistic/technical venture we’ve undertaken in almost 40 years together. Even though we’re used to working solo most of the time, working side by side has been an overall positive experience. We’re both meticulous workers and neither of us has a problem concentrating for long stretches of time. It’s not unusual to spend a 5 hr. stretch filming a 12 second scene. At 24 frames per sec., that’s 288 photographs, each taken separately, with camera motion and moving up to a dozen figures and props in between shots. Crazy? Yes, but it’s all worth it when you play back the movie and see the characters come to life! 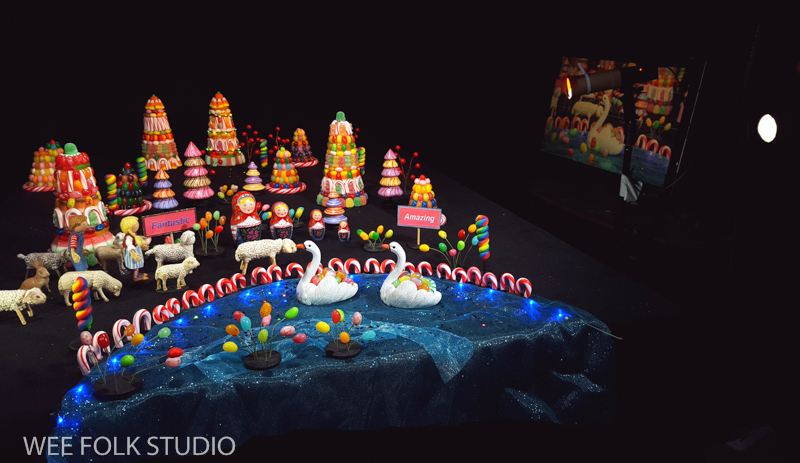 I got carried away making props – searching for jelly beans, gum drops and small scale sugary treats to decorate with. As a rule, I don’t use hot glue because it’s messy and stringy, but in this case it was an effective solution. I like how actual candy with sparkling sugar crystals adds a realness to the fantasy world. I lopped off the stems of mini sugar canes with a knife, saving the curved ends to build a border wall. 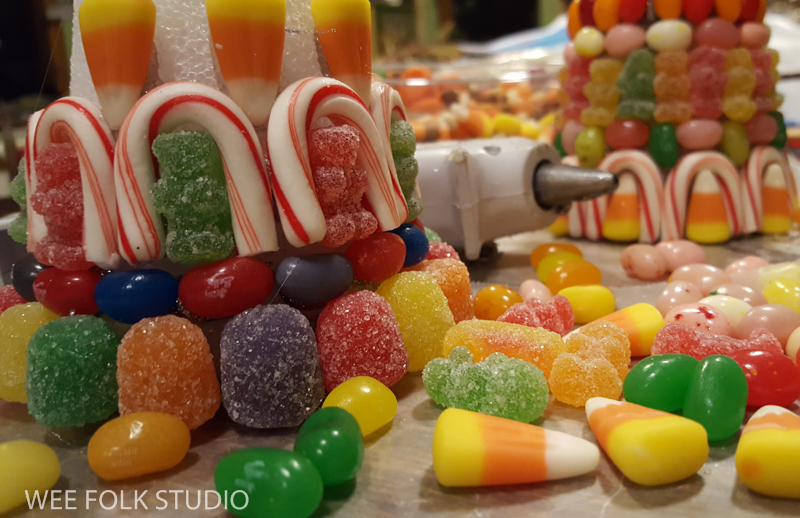 Handling all of this sticky candy was so unappetizing that it felt toxic, like working in a sugar Super Fund site. So far, no little critters have come out at night to nibble the edible set. This little campaign motorcade zooms along in the movie. I’m looking forward to hearing the sound effects! 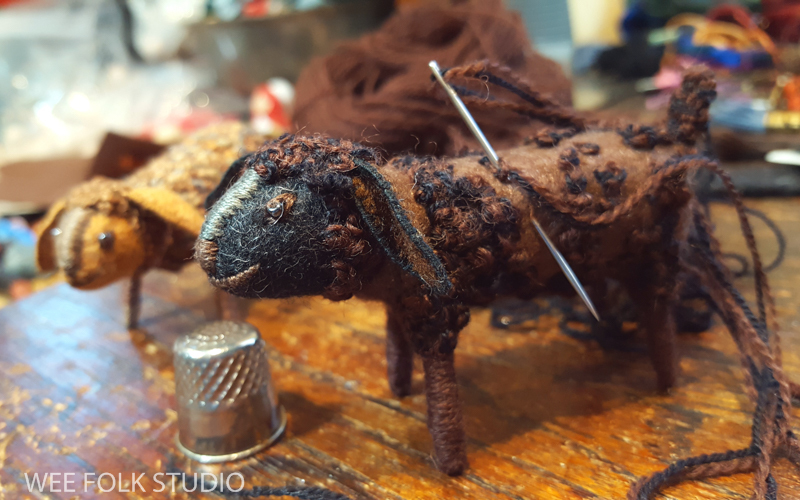 It was a relief to get back to needle and thread for this sheep character. 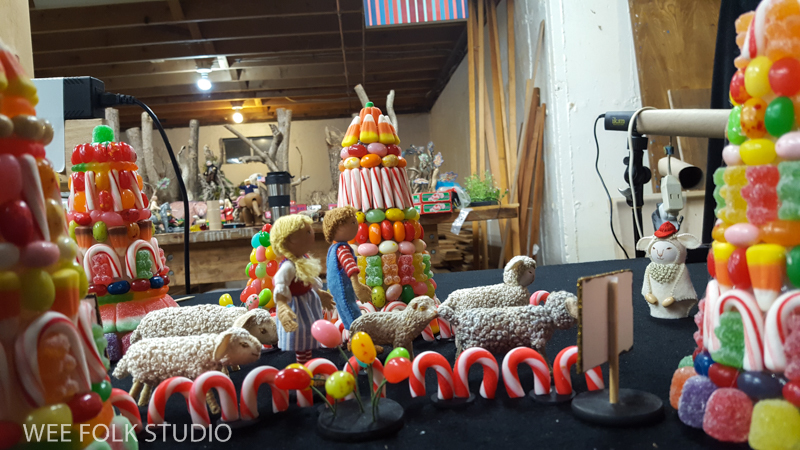 He joined the brown and rainbow sheep for a cameo scene. 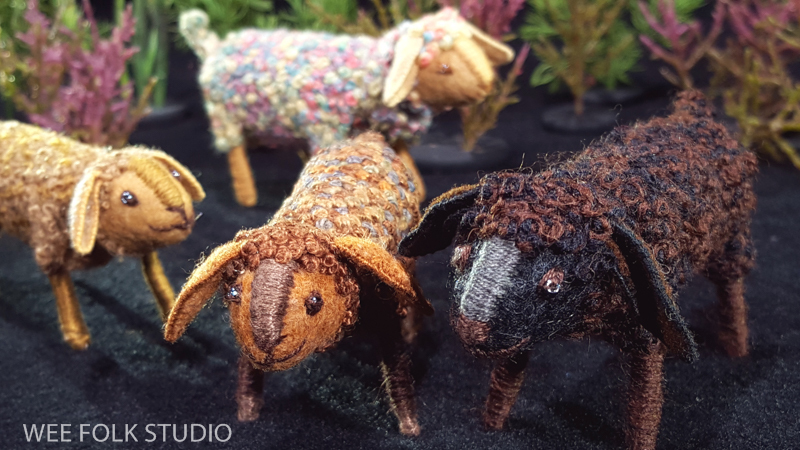 I manipulated their heads, ears and tails during the filming process. While doing the animation, I refer to a monitor (top, center) that projects the camera view. It’s tricky to move the bodies in small enough increments to make their movement look natural. 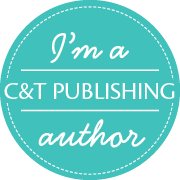 I would like to take this opportunity to thank all of you who take an interest in my work and read this blog, whether you’ve followed for years or just subscribed. Your support means a lot to me and it is an honor to connect with you and the world outside of my studio! For the past 6 months, my husband Rob and I have been making a film starring characters in the Wee Folk Players theater troupe. 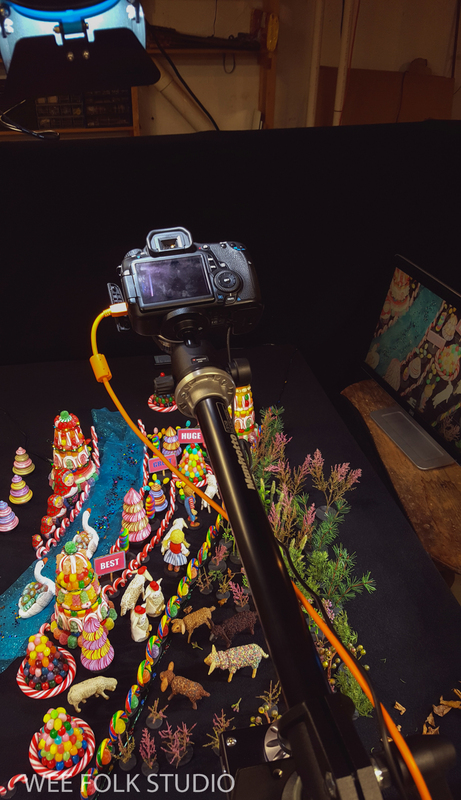 We’re working in stop-motion animation, where you basically take a series of photos, moving figures and/or objects in between shots, in itsy-bitsy amounts. When the photos are played in sequence at 24 frames per second, it appears like fluid motion. This process has got to be one of the most time-consuming art forms out there. 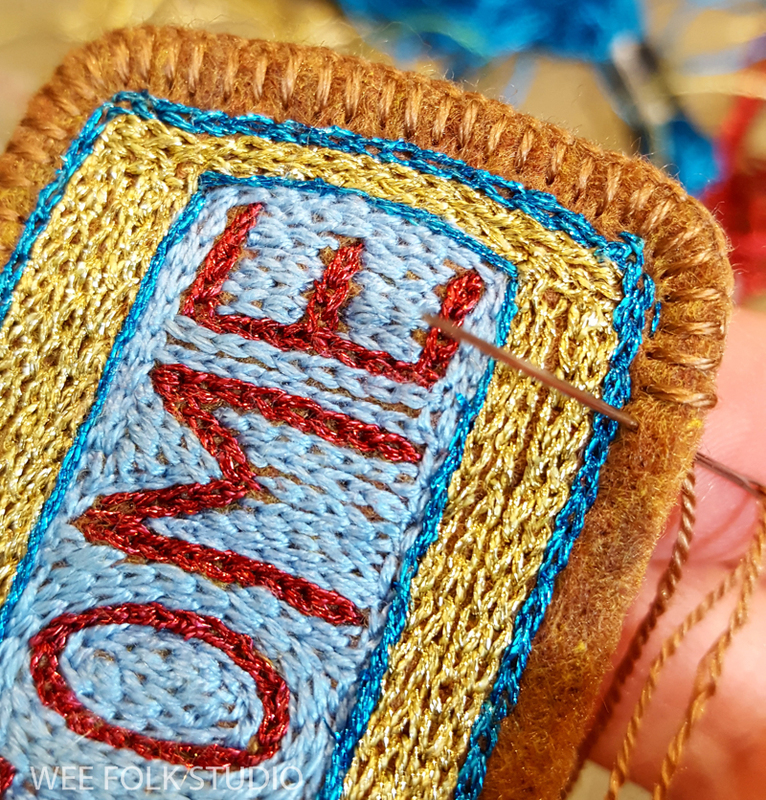 In some ways, it takes the same patience and attention to detail that embroidery work requires, with the added bonus of seeing your creations move! I’ve wanted to breath life into my figures through animation for a long time, but felt unprepared to take on the task, especially the technical parts. Now, with Rob’s help, I am able to advance my art into a new realm. We are very happy with how it’s coming out and hope to have a 10 minute film some time next spring. It will be a wordless story exploring our current and very unique political environment. 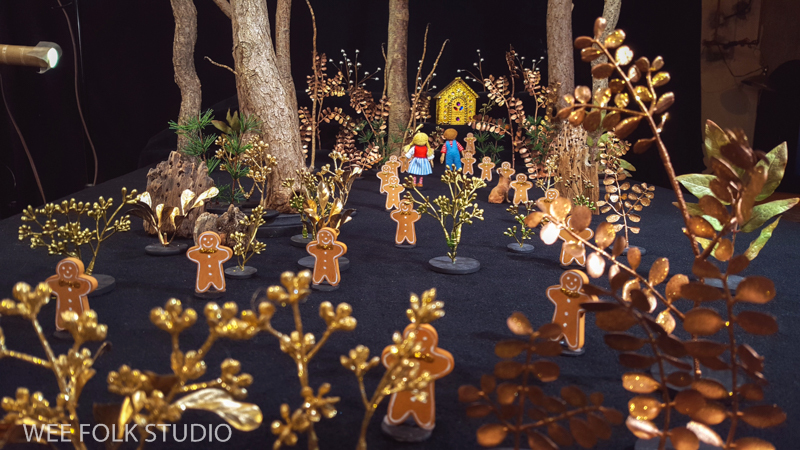 At the very end of this post, there’s a peek at our animation stage, with the scene we’re currently filming. 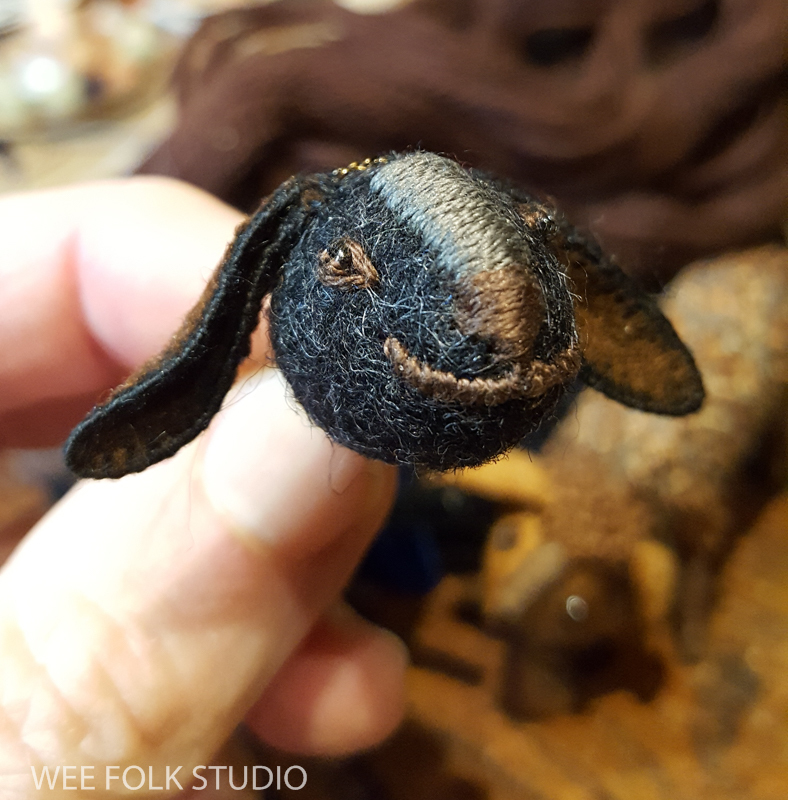 I can’t show you much yet, but HAD to share this latest member of the cast, who will have a cameo appearance alongside the leading man. Thread extensions were useful for her tri-colored hair and I had fun with her spiked heels. 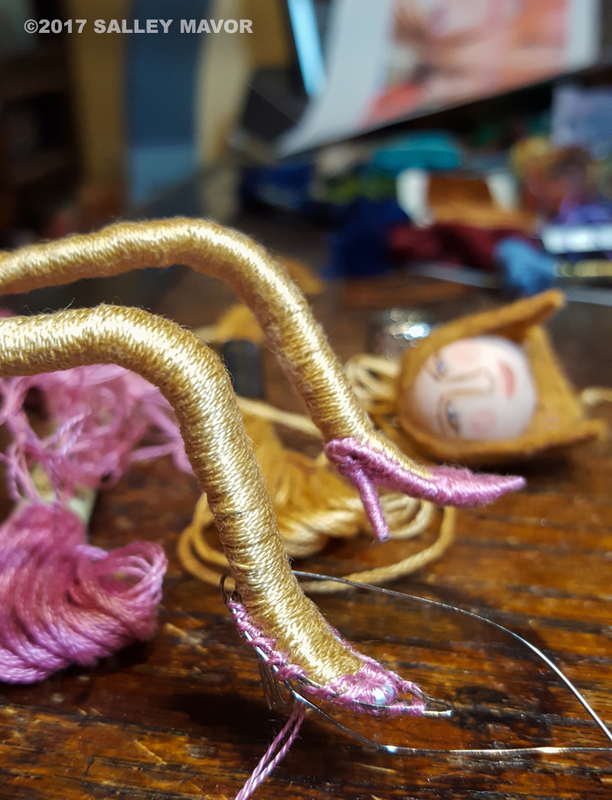 After her shoes were sewn in place, she and her sole sister Barbi commiserated about foot ailments. 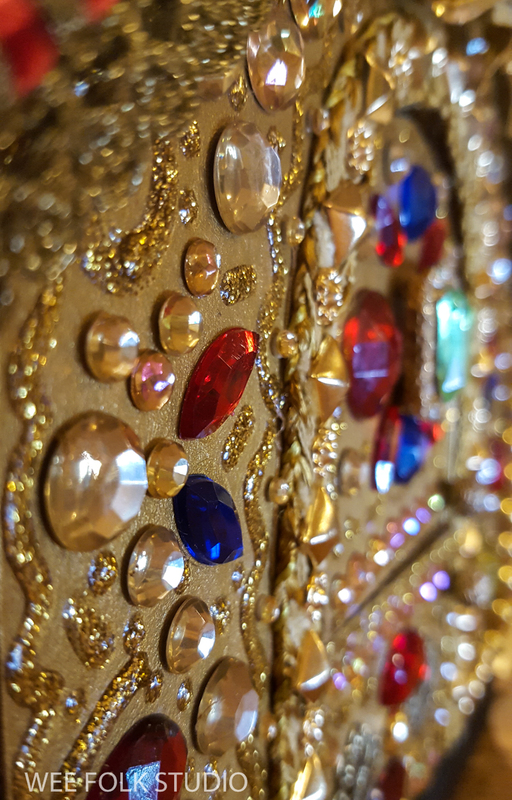 This is one of the final fittings for her custom made suit. Here she is, flashing her rock, while waiting to perform. 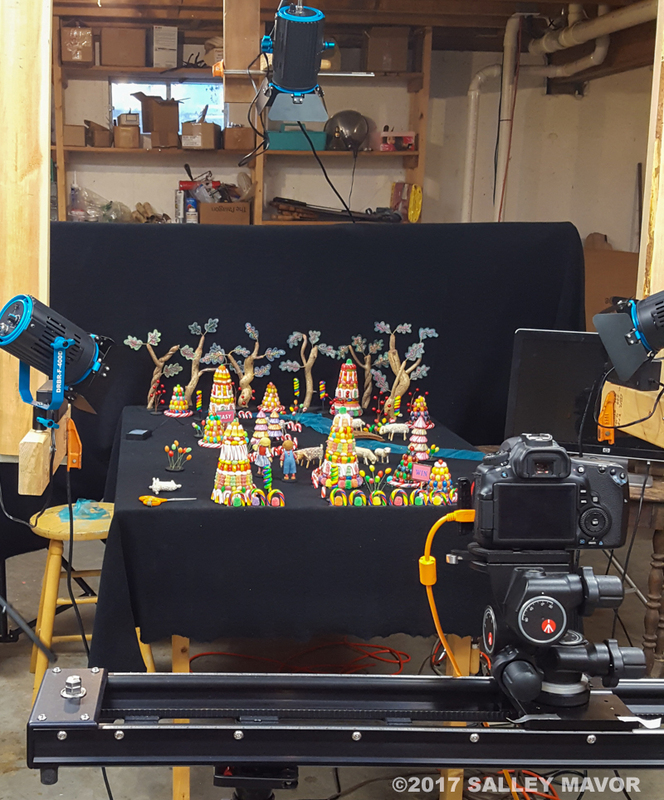 The animation stage is set up in the basement, with lights and a camera on a slider. 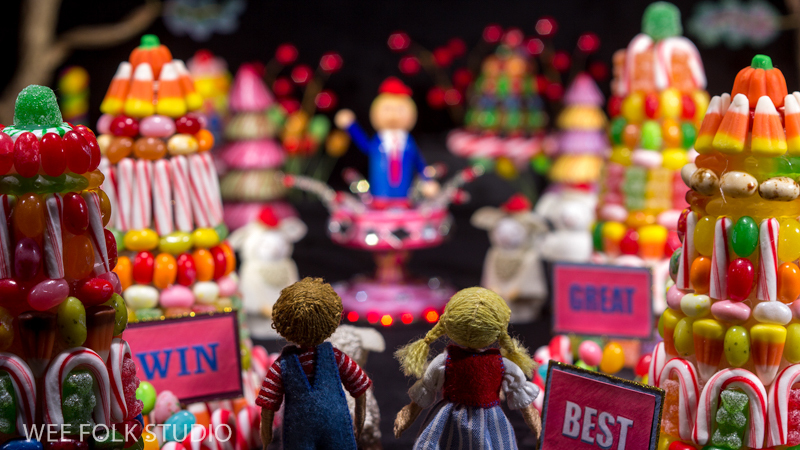 The scene bollow is made with real candy, so everything is pretty sticky. To give you an idea of the time involved, we’re currently filming a 10 second shot that totals 240 photographs. 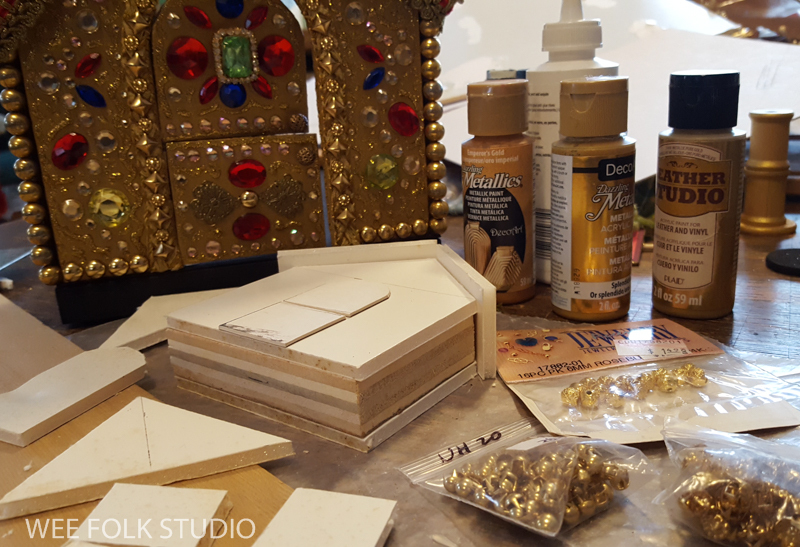 There’a a lot of action with many moving parts and I’ve already had to start over 3 times because of bumping props during the process. One could think of it as 6 hours of wasted effort, but every time I redo it, I learn something new and the results are more nuanced. Tomorrow, I will try again, being extra careful to move only the parts that need animating!